Grogreen NPK is a water soluble NPK line for drip irrigation. These formulations cover a wide range of nutrient ratios. Our products are balanced with a high nitrate nitrogen content, chlorine free and are instantly soluble. 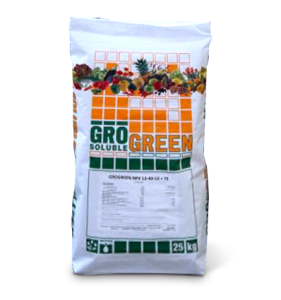 Due to its premium ingredients and balanced composition enriched with essential chelated micronutrients, Grogreen NPK is the basis of successful fertigation programs. This range consists of products adapted to the nutritional requirements of crops in different stages of development. Our products have followed a production process that ensures a formula with the maximum solubility of their nutrients. We have top-quality tailored products to meet the needs of different countries and for the different crops grown in each country. In addition, Grogreen NPK formulas are made for the different stages of crop growth. Convenient : Grogreen NPK covers all nutrients required during the growth cycle of a crop. Balanced fertilization : Our formulations are Potassium Nitrate based. Excess and build up of unnecessary salt components are avoided. Chelated : Iron, Zinc, Copper and Manganese are chelated to assure maximum availability. High purity product : Products are produced from purest ingredients and they are free of sodium, chlorine and heavy metals. Fully soluble : These NPK fertilizers are a free flowing, fine crystalline powder that dissolves quickly and efficiently in water.